By Hawksmoor in brown ink, to left of tower, Turris alt. / 200 ped :; and along column shaft, on left side of design, 100 - 0; and in graphite by Hawksmoor at top left-hand corner, Estimates; and by C19 hand at top right, 72. Pen and brown ink over graphite under-drawing, with sketched additions in graphite; on laid paper, laid down; 296 x 185. The sheet is laid down in the volume, but a preparatory sketch for the turret, in pen and brown ink, is visible in a back light and in the ink lines showing through to the recto. The design is for a lower turret of three main stages above a wider basement stage. There are three plans for the corner detail of the main stage that appear to relate to the design on the recto of the sheet. Hawksmoor has written on the drawing, in Latin, to the left of the tower 'tower height 200 feet'. This may refer to the height from the base of the pedestal of the order to the top of the attic cornice, as this measures just over 5 inches on the drawing, and columns, marked as 100 feet high, are just over 2 ½ inches on the drawing. If so, the tower would be an improbable 600 feet high. There is, however, another scale on the drawing, in the form of a line of prick marks set vertically on the left side of the first stage of the upper part of the tower above the attic. If this is a scale of 5 feet divisions, the scale of the drawing would be 20 feet to an inch and the total height of the tower would be about 225 feet. The tower was probably intended for a site on the central axis of the hospital. It may relate to the square-plan structure shown at the southernmost end of the long central axis of the plan of the second enlargement scheme at the RIBA (Hawksmoor /2; SA 28/6; former E5/6; Hart 2002, fig. 8). This is the site of the present-day Wolf Monument on the top of Observatory Hill. 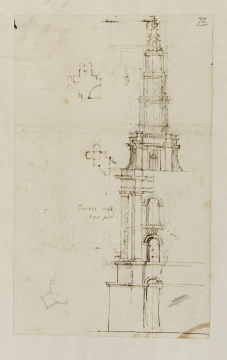 The sheet has been laid down in the volume, but a preparatory sketch for the tower, in pen and brown ink, can be discerned on the verso, as some of its ink lines show through. This design is for a lower tower of three main stages above a wider basement stage. Three part-plans of the corner features of the main stage of the tower are visible. These relate to the design on the recto of the sheet.